Back from our holiday in Perth and I’m thankful that we missed, by one day, their hottest day on record. Sydney has also missed the intense heatwaves of the southern states, but it’s summer and in this new extra warm world our time, for the great big heat, will come. Even without heatwave temperatures Sydney is hot, sticky and humid, the kind of weather when a basic ingredient like labneh comes into its own. It’s perfect summer food, crush some garlic, add a bit of salt and pepper an you have a perfectly delicious dip for bread but if you can exert yourself to gently braise some grated carrot and garlic it becomes something extraordinary. The carrots intensify and sweeten the tart creaminess of the labneh and a touch of lime zest and chilli give an extra tang and bite. 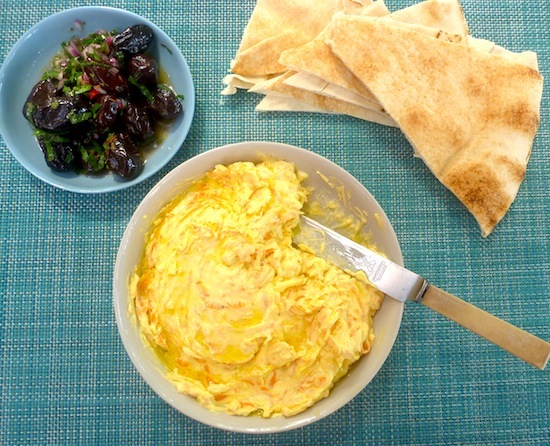 You can eat this labneh dip anytime for breakfast, lunch or dinner – with a few extras – some olives, watermelon, slices of tomato, cumber and red onion it becomes a simple summertime feast. This recipe comes from Greg and Lucy Malouf’s beautiful new book New Feast – Modern Middle Eastern Vegetarian, which, along with Yotam Ottolenghi’s Plenty More and Hetty Mckinnon’s Community are my favorite cookbooks at the moment. Melt butter and oil in large fry pan over medium heat. Add carrot and garlic and gently braise, until carrot is tender and bright orange (about 5 minutes). Season with salt, pepper, chilli flakes and lime zest and remove from heat. Allow carrot mix to cool down completely then add to labneh. 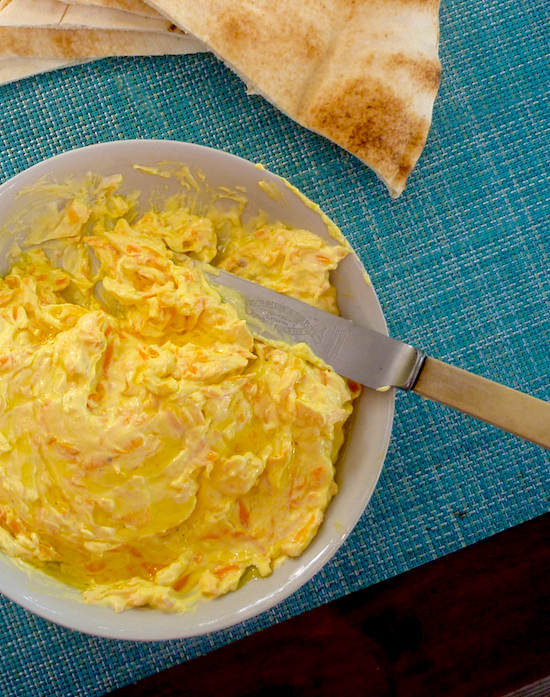 Beat labneh, carrot together with extra cream or yoghurt until completely mixed, taste and add extra seasoning if desired. Serve drizzled with extra virgin olive oil on top. Note -If you are making your own labneh here is a simple procedure. For this recipe the labneh should be drained for 12 hours. I feel absolutely blessed I got out of there before the extreme heat, when it gets so hot it always like a natural disaster. This sounds so unique & delicious! I have all the ingredients, so will give it a try with my homemade pita bread. I am currently reading Plenty & am sure it will be one of my new favorites. Thanks for sharing! Home made pita bread is the best, I was considering whether I should make some the other day but it is just too humid to bear baking at the moment. This sounds divine, perfect summer snacking food. We have been sweltering up here in Brisbane with very high humidity, and I always find that it affects my appetite. 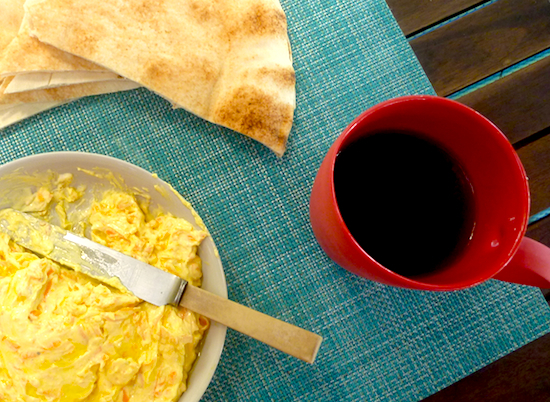 All I want is light, cool, simple food to nibble on – this sounds just right. It’s the humidity that is the killer, but the intense dry heat where you feel ever molecule of moisture is being sucked from you is bad too. HOW good is Plenty More? I bought it for myself in the Boxing Day sales and I’ve been obsessed ever since. And I’ve never thought to put carrot in labneh, isn’t that clever? I bet it was delicious, especially with the chili flakes. I haven’t made a huge amount of things from Plenty More yet. It always takes me a while to process a new cookbook but what I have made has been fantastic. This looks like the perfect warm weather food! We’ve copped some of the humidity in Melbourne this summer which I really don’t enjoy so these kinds of meals are exactly what I need! Thanks for joining the linkup again! Yum! This will be perfect for the horrible humid weather we’ve been having!